The club was established in June 1992 with the emphasis on being a friendly club for all abilities today. This is still our belief today, and the club consists of approximately 100 members (men and ladies) ranging from 18 to 80, from new runners to seasoned champions. We are affiliated to England Athletics and Kent County Athletics Association (KCAA), and predominately concentrate on road running, plus cross country. However, some of our members do participate in areas such as Track running, Ultras, Multi-terrain and Triathlons. Istead and Ifield Harriers meet on a Wednesday Evening at 7 pm at Cascades Leisure Centre. We also have a group for new runners on a Monday evening at 6.30 (also starting at Cascades Leisure Centre). We welcome runners of all abilities, and will find a group to fit you. If you are interested in joining email istead_membership@hotmail.com. Come along and give us a try for a couple of weeks. If you enjoy running with us, you need to become a member. Send an email to istead_membership@hotmail.com for details. Alternatively simply turn up at 7 pm at Cascades Leisure Centre, Thong Lane, Gravesend on a Wednesday training night or afterwards at around 9 pm in Jason’s Bar at Cascades. Our membership secretary will be pleased to answer any questions. Come along and try it out for a few weeks before you have to join. Please click here to download a membership form 2016 to 2017, and hand to any member of the committee. You will also need to purchase a club vest at £20. Membership is due at the end of March each year. We form groups according to abilitiy and training distance required. You will always have somebody to run with! During the summer our runs take us to Shorne Country Park, and the many footpaths and lanes beyond. Whilst in the winter we train under street lights around Riverview, Gravesend and Northfleet. A winter handicap series is also held. After a Wednesday run you can relax in Jason’s bar where food is available. We also organise speed training runs and Track and Field training in the Summer. In most local road races you will see the Purple Vest of Istead. We also promote cross-country running and compete in the various leagues and championships. The club organises social events during the year such as curry nights, club BBQ and occasional club holidays! It is rumoured that at some point in early 1992 over a “Jack Daniels” promotion evening, the idea of a new running club for North Kent was discussed……This came into fruition by June 1992 with the club name taken from the founders families addresses (Warren/Ramsey), living in Istead Rise and Ifield – hence Istead and Ifield. From these humble beginnings at our Istead Rise Community Centre Headquarters, the club grew to around 35 members by 1993 with the emphasis being on a friendly club for all. The club’s inaugural September 10K event from Istead Rise was popular and club competition racing extended to Kent Cross Country League, Fitness Cross Country League and South of Thames Cross Country League. The club grew steadily during the 90’s however the 10K had dropped off the calendar and pressure from the community centre over increasing subs lead Istead to seek a new headquarters at Cascades Leisure Centre. This proved a very good decision with much improved facilities, runs and several new members. In 1999 we held a new race starting at Shorne Country Park (Shorne Woods 5). This was held for a few years. Since then we became more involved with organisation of the North Downs Run. 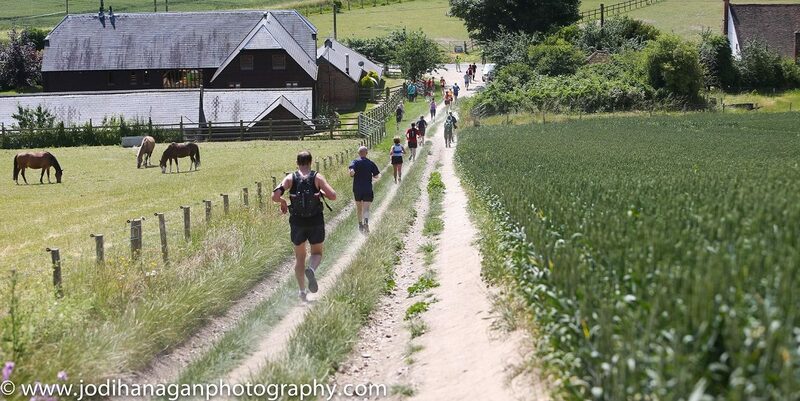 Eventually in 2004 we took on full responsibility for organising the North Downs Run – a 30K trail race that has been voted one of the top races in Runners World over the year. Today we have over 100 members and form one of Kent’s best running clubs for all abilities.